Author of Inside Zhan Zhuang (2013). The Nuts and Bolts of Standing Meditation. Part 1 continues with the basic alignments and body mechanics, opening the midriff to stretch the spine, finding your center from the back, feeling the five points, the low Dan Tien and Mingmen, explanation of the Kua, the biggest "joint" in the body, connecting the lines of gravity - front, back outside and inside. 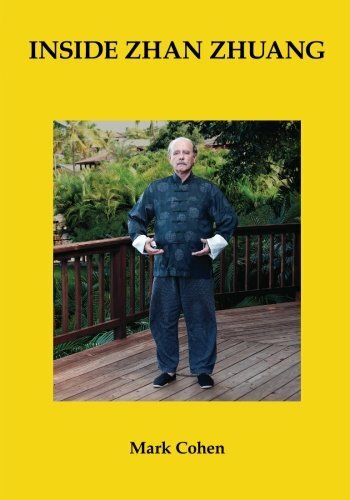 Part 2 summarizes, reviews and continues with the basic components of the Wuji posture, position of the legs, unlocking the knees, using gravity to release blockages, explanation of SUNG, the body's ideal state. Surrendering to gravity - dropping the weight below the feet, the two types of muscles - mobilizers and stabilizers. Part 3 concludes with the breath - half-moon and whole-body breathing, the chi breathing point, the Psoas muscles and the hanging basket - suspending the pelvis, closing technique for ending each practice session, how to apply what you've learned and what to expect as you explore the Wuji standing meditation practice. The United States Army Leadership Field Manual states that a military leader of “character and competence acts to achieve excellence.” He must be imbued with the values of loyalty, duty, respect, selfless service, honor, integrity, and personal courage. He must continually work to develop his mental, physical, and emotional skills to their fullest. He must demonstrate superior interpersonal, conceptual, technical, and tactical skills. He must demonstrate the ability to act via influencing others (through communication, decision-making, and motivation); by planning, executing the plan, and assessing it; and by improving himself by learning from experience. Above all, he must set the tone in preconditioning the will of his subordinates to sacrifice their lives if necessary. The only consistently credible way to do this—if the history of great military leadership is any guide—is to lead from the front as much as possible and share the risk of death with the lowliest foot soldier. Such a philosophy of leadership may underline why the Israeli and American armies are often thought of as the best military organizations today on the small-unit level. A 14 minute treadmill cardiovascular warm up routine. It takes less than 15 minutes to complete and since you can do almost anything for 15 minutes; there are no excuses, nike! Although labeled 'upper-body' this is a great workout for the quads as well. Repeat the curcuit three or four times. This is the first circuit that I am adding to my bi-weekly training routine. Repeat the circuit three or four times. Do not be deceived by the embusen rule. Advancing techniques simply attack, while retreating techniques imply defense. There is only one enemy at a time. Every movement in kata has martial meaning/significance. A hand returning to chamber usually has something in it. Control an opponent's head and you control the opponent. Kata demonstrate the proper angles. Touching your own body in kata indicates touching your opponent. Contour the body—strike hard to soft and soft to hard. Use this checklist to decide if a kata is golden or possibly sub-optimal. A sub-optimal evaluation might indicate that you have not been taught the "real" kata. See also the other two parts of this Checklist; Principles and Other Considerations.